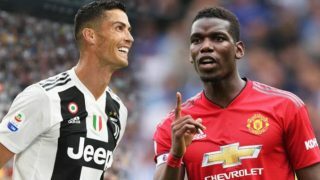 Speaking to the press ahead of Manchester United’s UEFA Champions League encounter with Juventus, Paul Pogba was full of praise for the ridiculously talented Cristiano Ronaldo. The Frenchman joked about how Ronaldo “scores as easily as he drinks water” with United set to face their former player at the Allianz Stadium on Wednesday night. Ronaldo, 33, joined Juventus from Real Madrid this past summer and he has already netted seven goals and created five assists in 11 Serie A games. An incredible record, though he has yet to score in this season’s Champions League. United will hope that remains the case tonight. Pogba’s claim about Ronaldo describes how easy the former United star makes goalscoring. “I thought it was a really good thing for Juventus [to sign Ronaldo]. Obviously it’s always good to have players like Cristiano in your team,” he said, as quoted by Goal. Is Pogba hinting at one day playing alongside one of those three players? In the past few months, he’s been linked with moves to Barcelona, Paris Saint-Germain and, of course, a return to Juventus. Back in September, The Express covered a piece that showed Barcelona as favourites (10/11) to sign the World Cup winner and it showed his former club, Juventus, were not close behind at 5/2. PSG came with bigger odds, 10/1, which the report puts down to the club preferring a swoop for Chelsea’s N’Golo Kante. However, a recent report from The Sun claims that PSG are lining up a mega-money move for the United midfielder.